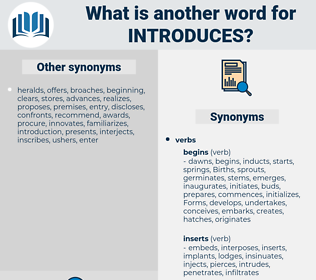 What is another word for introduces? outlines, initiates, showcases, hosts, starts, Gives, academics, adds, takes, passes, submits, announces. inserts, Criteria, observations, inputs, invitations, discusses, plots, joins, charts, exhibits, highlights, presences, features, displays, checks, paints, lists, profiles, Seeds, shows, aggregates, deals, showcases, submits. 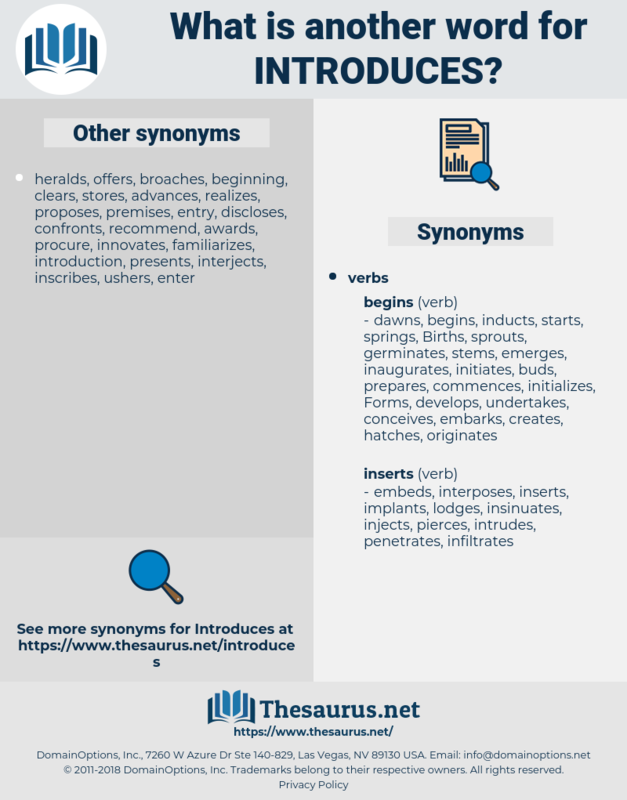 incorporate, Recommendations, induced, induces, insert, introductions, integrate, integrating, integrates, produces, implements, formulate, formulated, formulates, indicates, injects, includes, implementation, enforces, recommends, considers, consolidates, enacts, incriminates, Institutes, incurs, inserts, exists, Presenting, demonstrates, presentation, depicts, encourages, participates, embraces, administers, Submitting, reproduces, suggests, invites, domesticates, describes, informs, influences, organizes, invests, undertakes, recognises, contributes, contains, commences, creates, involves, invokes, reduces, ascertains, articulates, Establishing, establishes, confers, communicates, identifies, characterizes, renders, testifies, encounters, defines, contends, directs, complements, undergoes, educates, recognizes, conducts, consists, concludes, categorizes, amends, endorses, illustrates, dedicates, envisions, generates, enhances, governs, forwards, imports, inflicts, mainstreams, prohibits, reiterates, enter, organises, understands, supports, input, accommodates, revises, regulates, combines, intends, declares, denotes, accessions, Advocated, advocates, develop, develops, designates, promotes, fosters, contemplates, compiles, increases, disseminates, criminalizes, constitutes, mentions, explains, strengthens, underscores, publishes, admits, enumerates, facilitates, reports, explores, nominates, furnishes, ushers, Guarantees, receives, asserts, commits, derives, drafts, authorizes, determines, portrays, reflects, conveys, exports, compares, configures, corresponds, concerns, pertains, occurs, differs, begins, comprises, presupposes, Recalls, publicizes, propose, proposes, advises, enunciates, underlines, attracts, accepts, suffers, sets, empowers, triggers, prescribes, predicts, open, opens, translates, encompasses, enshrines, synthesizes, exhibit, captures, turns, covers, allocates, upholds, proves, imposes, employs, showcase, discloses, Permits, populates, delineates, devotes, summarizes, deposits, equips, onwards, assigns, transposes, specifies, announcement, adjusts, Lends, penalizes, transmits, achieves, dictates, Comes, stipulate, stipulates, reviews, sensitises, criminalises, purports, Entailed, entails, calculates, clarifies, supplements, summarises, embeds, embodies, arranges, teaches, cites, alters, enjoys, classifies, expounds, anticipates, places, entitles, forges, urges, mainstream, completes, attributes, Grants, modifies, proposals, boasts, holds, possesses, draws, operates, pursues, trains, applies, affirms, examines, Drives, fights, ensures, approves, reveals, Addresses, emphasizes, belongs, Affects, performs, observes, responds, acquires, Levies, strives, Carries, lifts, puts, tells, maintains, pushes, yields, feeds, shoots, appends, argues, provokes, requires, emphasises, assumes, attaches, elaborates, aligns, begets, forecasts, expresses, secures, assists, affords, results, exceeds, breeds, foresees, raises, lays, becomes, Faces, shifts, Strikes, evokes, harbours, Deems, drops, prints, sounds, treats, enables, sends, throws, airs, changes, inputs, struggle, arouses, vests, aims, helps, sinks, threatens, arises, epitomizes, prepares, fixes, stresses, builds, refers, terms, Lodged, lodges, respects, expects, shouts, leads, Leaves, wears, spends, speaks, emcee, tackles, Dives, seems, pitches, Bears, files, spawns, engages, signifies, slides, mounts, seeks, engenders, fires, causes, alleges, Focuses, focusses, states, slips, allows, exposes, mandates, broaches, handles, favors, relates, knows, alerts, shares, sells, leverages, implies, runs, typifies, stands, prefers, casts, represents, tends, obliges, hooks, reads, plunges, Plays, varies, jumps, envisages, breaks, pays, amounts, extends, arrives, coach, Tracks, Forms, discusses, plans, PAVES, assures, serves, asks, joins, Has, falls, wishes, keeps, marks, calls, says, charts, exhibits, matches, cares, signals, finds, poses, highlights, features, displays, tries, meets, begs, sees, Exercises, paints, lists, favours, profiles, gets, looks, means, goes, Does, POPS, approaches, shows, lets, sheds, deals, outlines, initiates, showcases, hosts, starts, Gives, adds, takes, passes, submits, announces. The first act introduces us to Jack Chesney's rooms in college. It is half an hour before the race is due, and, by way of beguiling the time, Cusack shouts to one and another of his acquaintances opposite, and introduces his father to the crowd generally.